Replacing your home thermostat is one of the simplest electrical tasks you can perform. 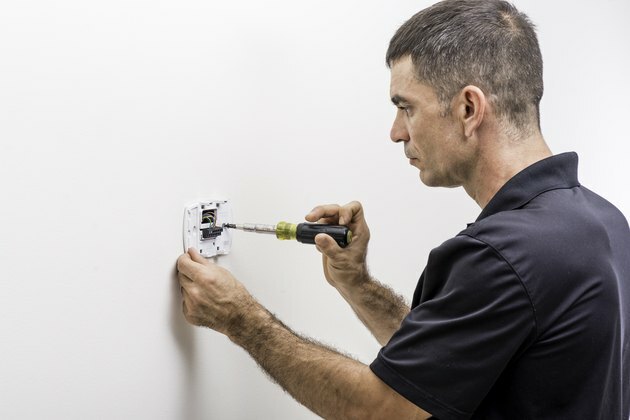 Whether you have a manual, programmable or smart thermostat to install, there's no need to hire an electrician to complete the task because regardless of thermostat type, thermostat wiring is identical functionally. To replace a thermostat yourself, you just need to pay attention to the wires attached to the old thermostat. Although not all thermostats are compatible with every type of home system, the way thermostat units are wired is essentially universal: Thermostats use a series of color-coded, low-voltage wires installed into a series of terminals controlling fans, heating functions and other parts of the home heating and cooling system. These wires are labeled based on color, with the greatest variation coming from whether a system uses a C-labeled Common wire or if one wire color is associated with a differently-labeled terminal. For this reason, most wires are labeled by electricians during the thermostat installation process. If they aren't, they can be labeled easily during one of the first steps of replacing your old thermostat. The first thing you'll need to do to replace your thermostat is to uninstall your current home thermostat. To begin, go to your circuit breaker box and turn off the power supply to your heating and cooling system. This will prevent any risk of suffering a nasty electric shock while working with thermostat wiring later on in the installation process. Next, head to your old thermostat and remove the unit from its mounting plate, then unscrew the old thermostat mount while being very careful not to disturb the wiring. Once you've exposed the wiring of your old thermostat, you can begin the process of wiring up your new one. Take a photo of the existing wire arrangement, making sure the terminal labels are visible. Using a screwdriver to loosen the terminal connections, remove the wires one by one. If the wire isn't labeled already, use masking tape to mark each wire as you remove it from the old thermostat's mount. When all the wires have been labeled and removed from the terminals, remove the old thermostat's mount. Thread the wires through the wire hole on your new thermostat's mounting panel, then connect each wire to the appropriate terminal following the instructions printed on the panel and the existing wire labels. Tighten each wire into the terminal with a screwdriver. You may then use a drill, screws and drywall anchors to secure the new thermostat panel to the wall. Once your thermostat's wiring process is complete, simply plug your new thermostat into the base panel and restore the power. With the thermostat installation complete, you will now be able to configure and use your new thermostat with your home's heating and cooling system.